United States Supreme Court Justice James Moore Wayne is the most famous Georgian nobody knows. When his home state seceded from the Union in 1861, Wayne retained his seat on the US Supreme Court and remained loyal to the Union as the nation lunged headlong into war. He knew the insanity of secession, and warned of the folly of disunion, but his son, Col. Henry Wayne, resigned his commission in the US Army and cast his lot with the Confederacy. This book tells their story and examines the nature of Georgia’s strong and largely overlooked unionist sentiment in the decades before the Civil War. Wayne’s father was loyal to the British crown during the American Revolution, and was branded a traitor. His son remained loyal to the Confederacy during the Civil War, and was branded a rebel. 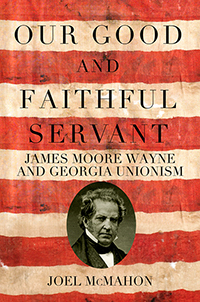 Yet, Wayne stood foursquare for the Union and remained loyal to the nation he served, and in his mind, remained faithful to the state he loved. Wayne and his staunch stand for union before and during the Civil War mark him as an outlier in the story perpetuated by the Myth of the Lost Cause, but Wayne’s story opens a long closed window into the economic, political, and social dimensions of unionism in the state of Georgia. Written with the precision of an engineer, analyzed with the acumen of a financier, and researched with the critical eye of the historian, Our Good and Faithful Servant adds to a growing number of works exploring the struggle between supporters of union and disunion during the Antebellum Era.